FREE ESTIMATE. To auction, buy or sell Terminator costumes in our Terminator costumes auction, please contact NateDSanders.com at (310) 440-2982 or Nate@NateDSanders.com. Thank you. Arnold Schwarzenegger “Terminator 2: Judgment Day” Terminator costumes. Directed by James Cameron, the 1991 sequel proved a wild success in the franchise. As one of the most famous characters in film history, Schwarzenegger played a reprogrammed “T-800 Terminator” sent back in time to protect a young John Connor in the film. 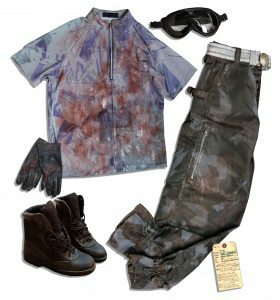 Costume includes a simple “Hanes” brand cotton olive-green t-shirt, size XL, a pair of pleather biker pants, and a black leather belt with a metal buckle. Pants measure 36″ x 48″ with 9″ zippers at each ankle. Belt also measures 36″. Pants are presumably intentionally ripped at knees exposing a black felt lining. Some distress to pants and flaking of pleather material. Very good. 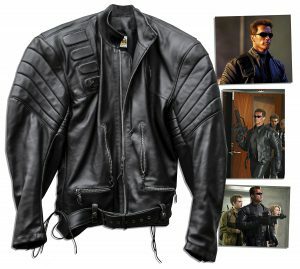 With a Prop Store COA certifying these Terminator costumes as authentic. Arnold Schwarzenegger leather jacket from “Terminator 3: Rise of the Machines” Terminator costumes. Schwarzenegger stars as the eponymous character. Cumbersome black leather jacket features padded segments and a zip front. Bates brand jacket has been distressed with scattered tears and abrasions. Linda Hamilton’s “Terminator 2: Judgment Day” Terminator costumes. Hamilton starred in the successful 1991 sequel to the mega-hit under James Cameron’s direction opposite Arnold Schwarzenegger. 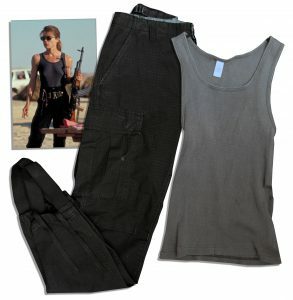 As Sarah Connor, Hamilton was dressed in this wardrobe during the trailer park camp scenes during which she arms herself, and also in the action scenes set in the steel mill at the film’s conclusion. Lot includes a grey ribbed cotton tank top by Calvin Klein in size M, distressed by production with tears to the back, and a pair of black cotton combat trousers by Prestige Apparel Mfg. with stirrups. Approximate size 26 pants are also distressed with a few holes. With COA from the Prop Store attesting to the Terminator costumes being authentic. Script for “Terminator 2” personally owned by one of the film’s producers, BJ Rack. Draft is dated 18 July 1990, and features hand notes on six of the pages with commentary such as “Stuntman in car” and “could be out of continuity because this part of house not messed up”. Accompanied by a collection of pages from a revised draft, dated 10 September 1990. Screenplay has the label, “Property of Lightstorm Entertainment, Inc. / Not For Duplication” and “T20056″ printed in red across every page. Script runs 124pp., with a few pages not included. Revised page section runs 16pp. 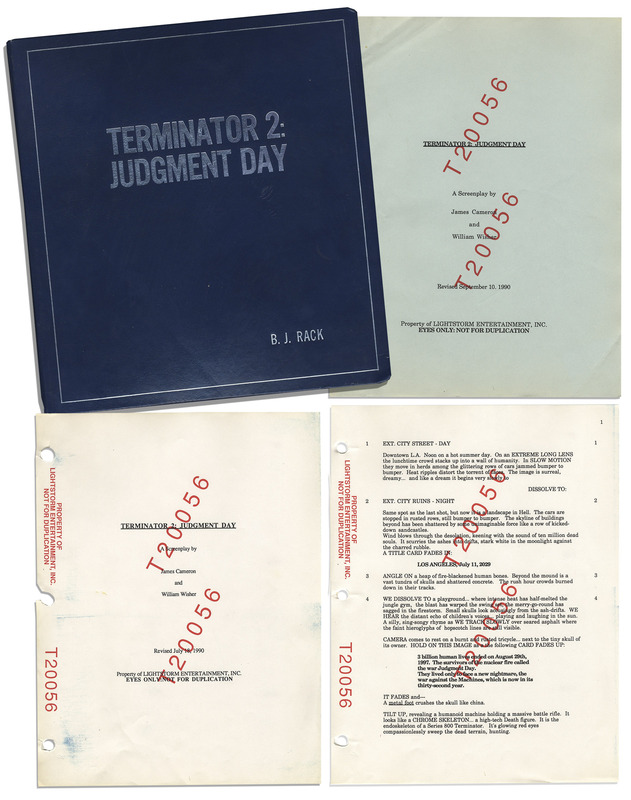 All 8.5″ x 11” sheets have 3-hole punches to left edge and are housed in a “Terminator 2: Judgment Day” binder. Near fine. 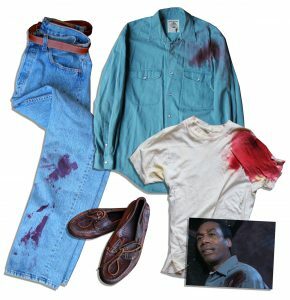 Joe Morton Terminator costumes from the 1991 film, “Terminator 2: Judgment Day”. Morton starred in the successful sequel as Dr. Miles Bennett Dyson, director of special projects at Cyberdyne and credited with the creation of Skynet. 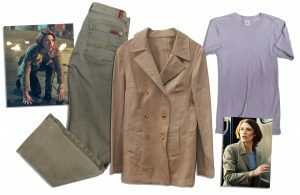 Wardrobe includes (1) long-sleeved teal cotton button-up shirt by Banana Republic in size M, heavily stained with prop blood to the left shoulder; (2) white cotton crew-neck t-shirt by Fruit of the Loom in size M, also stained with prop blood and cut with a small tear to the left shoulder; (3) pair of Levi’s jeans featuring prop blood stains especially to the left leg. Button-fly jeans are size 30 x 32; (4) brown leather belt with contrasting stitching in size 32/80; (5) pair of brown leather Timberland loafers in size 13 also spattered with prop blood. With COA from the Prop Store stating that the Terminator costumes are authentic. Costume from “Terminator 3: Rise of the Machines”. Worn by Nick Stahl as lead man “John Connor”, ensemble was seen at the beginning of the film when Stahl addresses the troops; outfit was also worn for an extended scene during the future war that did not appear in the film. 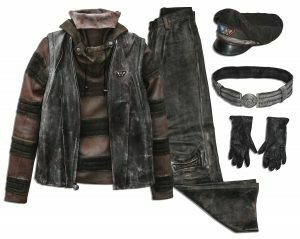 Six-piece ensemble comprises (1) pair of distressed grey camouflage cargo pants, made of nylon and featuring a zip fly with elasticized waist and cuffs; (2) short-sleeved camouflage shirt made of spandex with a zipper detail near the collar by Kohshin Satoh brand in approximate size M; (3) pair of distressed black goggles; (4) pair of distressed black lace-up combat boots by Lawpro in size 9.5 labeled “oil resistant”; (5) pair of distressed black leather gloves in size 8.5″; (6) silver and black cloth belt with round metal buckle. Lot includes a plastic case labeled, “John Connor Parts” containing three silver colored metal pieces and eight small round button-like pieces. 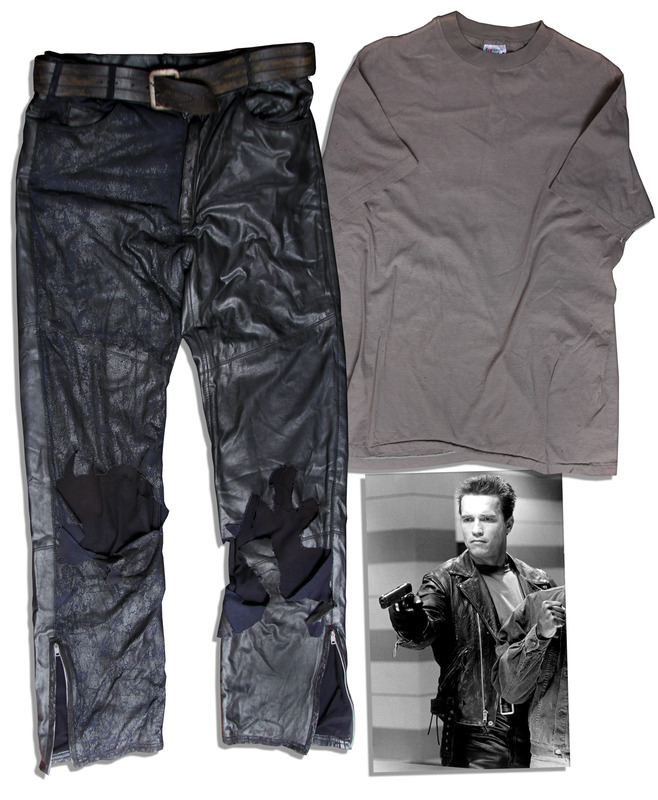 With a Prop Store COA certifying these Terminator costumes as authentic. 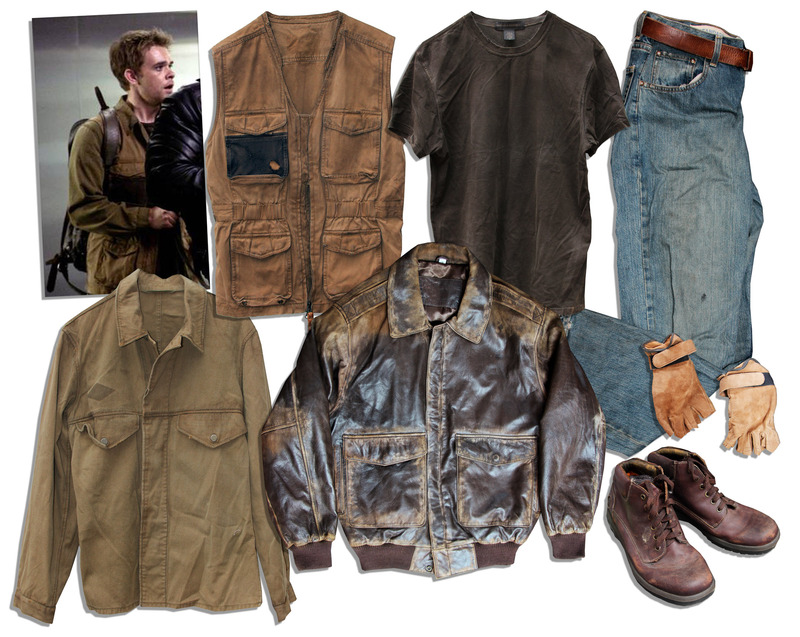 Nick Stahl costume from his role as the famous “John Connor” in the 2003 film, “Terminator 3: Rise of the Machines.” Stahl’s costume in the third film in the successful series includes: (1) brown leather collared jacket with no brand tag, size medium, measuring 21″ shoulder-to-shoulder. Inside a pocket of the jacket is a pair of beige worn suede fingerless gloves. Some minor wear to leather; (2) pair of “Gap” blue jeans, size 32″ x 32″ with a brown leather belt intact; (3) green “Banana Republic” t-shirt, size medium; (4) olive green button down shirt, no size though 18″ shoulder-to-shoulder; (5) rugged brown waistcoat vest measuring 18″ shoulder-to-shoulder; (6) pair of brown “Timberland” brand work boots, size 10, with original socks in each shoe. Near fine overall. With a Prop Store COA. Claire Danes Terminator costumes from ”Terminator 3: Rise of the Machines”. Danes played ”Kate Brewster” in the film, one of the targets of the new model of Terminator, T-X. Costume was production-used in an extended scene set during the future war, though which wasn’t included in the film. Costume includes: (1) a Koshin Satoh brand cotton turtleneck sweatshirt paired with a Tony Nowak brand worn leather waistcoat with a badge featuring three interlinking triangles, 16″ shoulder to shoulder x 23″, both intentionally distressed;(2) a pair of worn leather pants again distressed, 26″ x 39″; (3) a silver belt with round buckle; (4) a pair of goggles; (5) a military cap with a matching badge to the one on the waistcoat; and (6) a pair of black dirty gloves. With original wardrobe tag. Near fine. Claire Danes Terminator costumes from “Terminator 3: Rise of the Machines”. Danes played “Kate Brewster” in the film, one of the targets of the new model of Terminator, T-X. 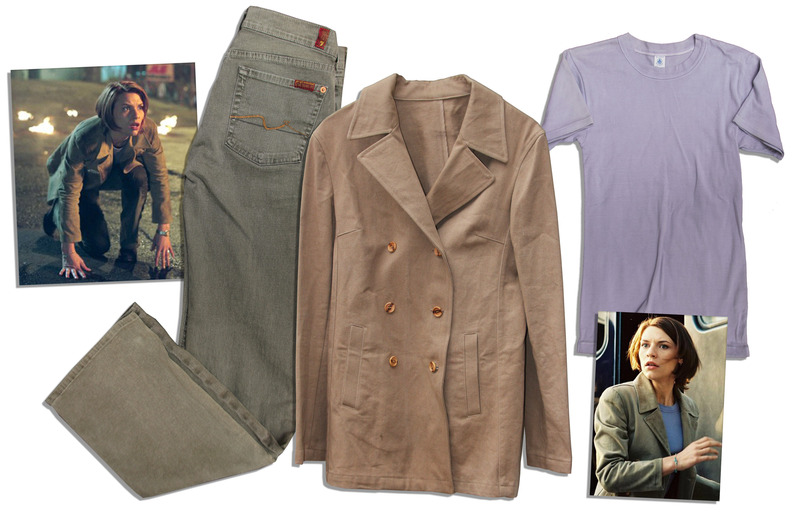 Costume includes (1) beige quarter-length trench coat jacket with no tag or size, though 17″ shoulder-to-shoulder and 33″ in length; (2) lavender “Petit Bateu” cotton t-shirt, made in France with an “18a/168cm” size, and (3) pair of “Seven” brand boot-cut grey-green jeans, size 28. Jacket has a tiny smudge of dirt, else near fine. With a COA from The Prop Store. (#43314). Please let us know if you have any Terminator Costumes that are for sale.